On Tuesday 13th December there will be an additional concert by young pianists of our area to commemorate the work of our late Chairman, Laurie Giles, in this field and to celebrate their developing talent. The majority of these young people have been tutored by David Murray and Eileen Bown, well known for their musical work in the area. The recital will be at 7.15 pm in the Sunderland Museum and Winter Gardens. Admission is £5. This entry was posted in Recitals on 28/11/2016 by David. 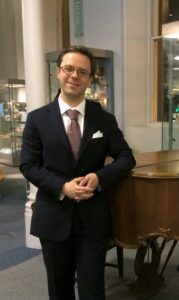 Lovers of classical music were treated to an excellent concert on Tuesday evening at the Sunderland Pianoforte Society, in the Museum and Winter Gardens. The pianist was Ashley Fripp, making a very welcome return visit to the Society. The first half of the programme consisted of two contrasting sonatas – opus 10 no.3 in D major by Beethoven and opus 14 in D minor by Prokofiev. 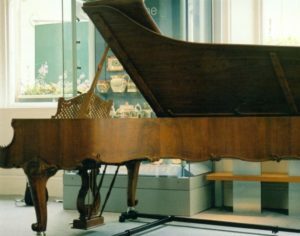 Ashley took full advantage of the piano’s dynamic range to express the differing moods of the various sonata movements. His performances of both works were powerful, but delicate where the music demanded. The second half of the recital was devoted to Rachmaninov Preludes – the set of ten forming opus 23, preceded by the well known prelude in C sharp minor (opus 3 no.2). Ashley Fripp has a formidable technique allied to a deep understanding of the pieces he is playing. He was able to establish good rapport with the audience, and gave us a sensitive and altogether satisfying recital, with a Chopin mazurka as an encore. This entry was posted in Recitals, Reviews on 23/11/2016 by David.